The Coal Country Chamber of Commerce announced FNB Benld Banking Center as the 2012 Business of the Year at their 14th Annual Banquet. 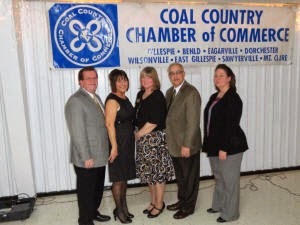 In the photo from left to right are Kim Harber, Senior Vice President of Madison Communications who was the keynote speaker of the evening; Dona Rauzi, President of the Coal Country Chamber of Commerce and Agent for Pegasus Travel; Dione Rabida, Branch Manager of FNB/Benld Banking Center; Rory Makler, Senior Vice-President of FNB; and Nadine Ferrero of FNB/Benld Banking Center. FNB/Benld Banking Center received a plaque designating their winning of the Business of the Year for 2012, a gift certificate for a stay at Hampton Inn in Litchfield, and an appearance on the CCCC/WSMI talk show.